Pancakes are one of the easiest things in the world to make and allow you to whip up a delicious batch of indulgence for a lazy weekend brunch. This classic buttermilk recipe is basically foolproof! 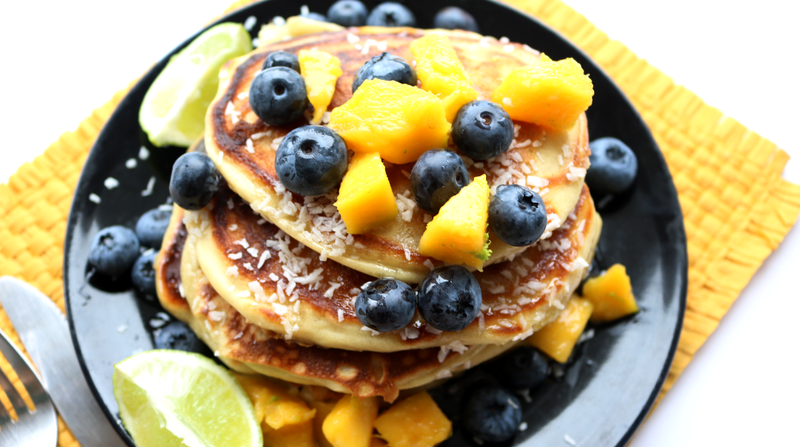 If there is one food that I could only eat for breakfast for the rest of my life, it would probably be pancakes. This original Instagramable brunch treat (yeah, move over Avo on Toast! ), is both comforting and indulgent, yet ridiculously easy to make at home with some very basic ingredients. 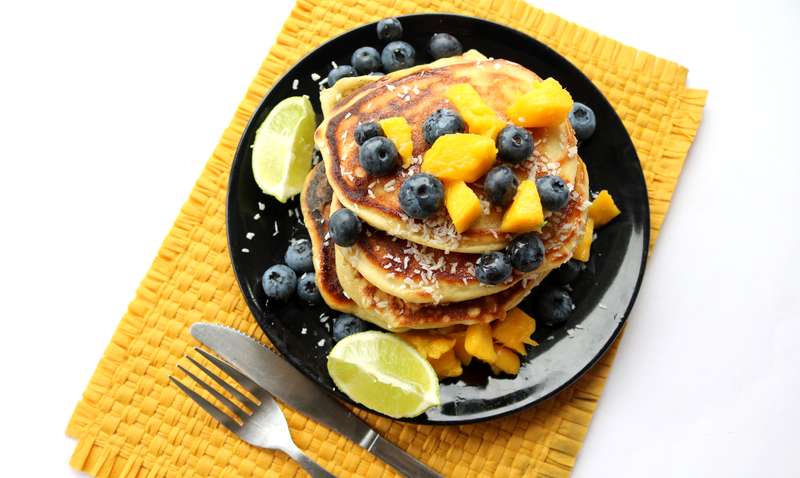 I've tried many different pancake recipes over the years and the best ones always involve Buttermilk as a key ingredient which you can find in most supermarkets. I would always suggest buying the best quality dairy that you can afford (free-range and organic is the way to go), and you'll see a noticeable difference in the end result. In a large bowl, add the Plain Flour, Coconut Sugar and Baking Powder, gently combining everything together. Add a pinch of Salt. Make a well in the centre of the bowl and add the Eggs, melted Butter and the Buttermilk. Lightly whisk together until the mixture is smooth and free from any lumps. In a separate small bowl, mix the cubed Mango with the Lime Zest and set aside. Place a large frying pan over a medium heat and add a little Butter. For each pancake, measure out 2 tbsp of the batter mix so that you can make 2-3 pancakes at the same time. When you start to see bubbles on the surface of the pancakes, flip them over and cook for another minute until nicely golden brown on each side. 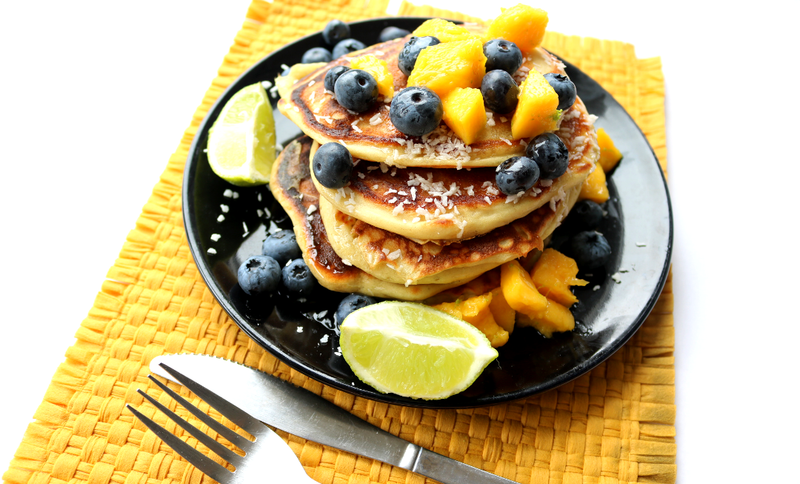 Stack the pancakes onto a warm plate and sprinkle over the Desiccated Coconut, Mango and Blueberries, with a generous drizzle of Maple Syrup. Add some Lime Wedges on the side for an additional squeezy zing if desired. Enjoy! Storage tip: If you have any leftover pancake batter, transfer it into any kind of Tupperware style container with a tight lid and store it in the fridge, where it'll keep for up to 2-3 days. Do you love making pancakes at the weekend?